Baidu, China’s answer to Google, and Xiaomi, which has modeled itself on the success of the America’s most successful technology manufacturer in Apple, have announced a strategic partnership to tackle two emerging technologies, internet of things and artificial intelligence. Announced today at Xiaomi’s first developer conference in Beijing, the alliance is a marriage between the third most valuable publicly traded Chinese technology company in Baidu and one of the world’s most valuable private firms, Xiaomi. Clocking in with a market capitalization of $86 billion, Baidu is no slouch on the global technology stage — with AI and deep learning among its core focuses — while Xiaomi has become a key player in China and made inroads in emerging markets like India thanks to its affordable phones and smart devices which punch well above their price tag. 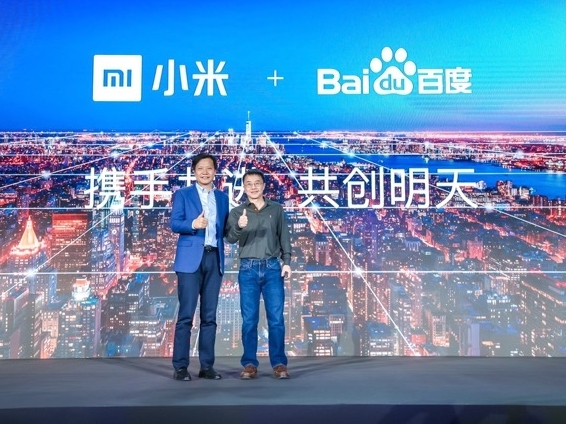 The duo are announcing a collaboration for the first time, but TechCrunch understands that Baidu’s conversational operating system — DuerOS — is already present in some Xiaomi hardware. That’s little known because it was left unbranded, but now the companies have made their partnership official. Exact details of the tie-up are not being disclosed right now, but the two firms said will immediately explore opportunities in voice recognition, deep learning and computer vision, in addition to more work with DuerOS. Further to that, Baidu’s tech reach also extends into robotics, AR, VR and self-driving cars, which could also be areas of joint cooperation in the future for Xiaomi. Even if the two companies are just partnering for the domestic Chinese market a real partnership that does more than pay lip service to the potential benefits of technology sharing would make each far more competitive than either one on their own. Baidu has favored a partnership based approach with hardware makers to get DuerOS and other tech into the hands of consumers. The company doesn’t charge a license fee for the OS — the same applies to this Xiaomi deal — and it claims to work with 130 companies that cover smartphones, smart TVs, smartwatches and home appliances. Most notably, it recently released details of its first smart speaker, the very uniquely designed Raven series. The product was the fruit of its acquisition of hardware startup Raven earlier this year, but Baidu also roped in Sweden’s Teenage Engineering, which is known for pushing the envelope on hardware design.